To a new member, the Guardians of Gallifrey is an established organization. A fan club which is just, well…IS! But how did it become that way? There wasn’t always a Guardians of Gallifrey in the world. Well, many moons past, there were two Whovians, who later became three Whovians, who thought it would be a really neat idea to start a local Doctor Who fan club. Not too bad an idea, eh? Let’s take a moment to look back on the events which lead to this “really neat idea.” I arrived in the United States from England in 1983, rudely yanked away from the weekly world of Doctor Who and the newly regenerated Peter Davison. I was mollified upon discovering that friend Cathi K, who lived down towards Walt Disney World at the time, could pick up WEDU/Channel 3 out of Tampa if the aerial was pointed must so and if there were no thunderstorms or aeroplanes between her house and the TV transmitter. I became enthralled in the adventures of Tom Baker once more, while trying to explain a few of the basics to a bemused Cathi about the wonders of Doctor Who. (She soon caught on; must have had something to do with her reading about forty of the Target novelizations in three weeks!) Following the program one night, a Doctor Who Festival was announced for Tampa. We decided to go – our first convention adventure. The con was great (Jon Pertwee and Elizabeth Sladen), and from that moment on, the Doctor Who bug was firmly entrenched in the pair of us. It was at this time that the “really neat idea” was born. Back in Orlando, a foray into a local SF store brought to our attention a young man named Greg C. A note on the bulletin board proclaimed that he was interested in forming a local Doctor Who group and listed a phone number. We called immediately – here was a person who shared our (so far unmotivated) vision. Greg, it turned out, had recently moved to Orlando from New York. The sign had been in the sore for several months. We were the first people to phone! After our initial contact, we spoke to each other often, but did not actually meet until another convention in Tampa (the UNIT Reunion). It was then that the nebulous fan club idea solidified into something tangible. We were going to do it! We were serious and meant business! We put our heads together and worked out a plan of action. At the time, we were keen to become a chapter of the Doctor Who Fan Club of America, which required a minimum membership of 25 Whovians. Our scheme to find these Whovians locally was simple. We would post a more enticing sign on the bulletin board and wait to hear from prospective members. (Considering how well it worked the first time, we should have known better, right?) Several long months later, after names had trickled in at an agonizingly slow rate to the count of 15, we said, “to heck with it, let’s call the meeting now!” which we did. The first meeting of the Guardians of Gallifrey, then nameless, gathered at Greg’s house on June 14, 1986. Quite a lot of discussion went on that day, as we outlined our tentative plan for the club, and people offered their suggestions. (Although for the most part, they seemed content to sit back and listen to us talk.) Questionnaires were handed out; pizza consumed (now a GOG tradition); and a video watched. (I can’t for the life of me remember which one, now.) We agreed to go ahead and seek chapter membership with DWFCA. A meeting was scheduled for the following month, and surprisingly enough, a lot of the people came back, and some brought friends! The first few meetings were simple gatherings, watching videos and holding discussions as we tried to gain our feet. The most important decision made during those first few months was that of our club name, needed for the club charter. But our membership swelled, and on August 15, 1986, we sent off our charter application. On the original membership roster were 27 Whovians. We received a letter from DWFCA on October 28, 1986. We were official! The Guardians of Gallifrey was now a charter chapter of the nationwide fan organization. The Guardians of Gallifrey continued to grow, aided by two particular events which pushed the club to the forefront, consolidating our presence and increasing our membership in the process. 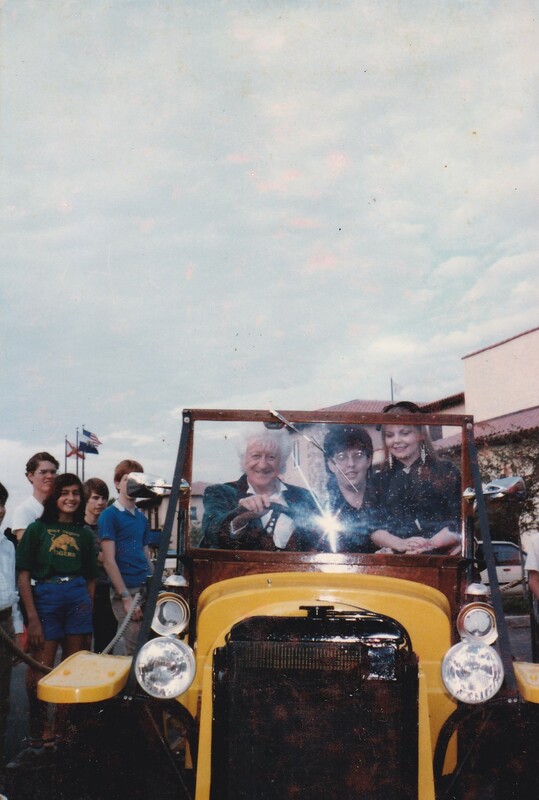 One was our appearance on WMFE-TV/Channel 24, and it was our acquaintance with Channel 24 which led to the other, more major event: staffing the BBC Doctor Who Bus Tour with Jon Pertwee when it came through Orlando on February 21 & 22, 1987. It is now 1989. A lot has happened since that handful of curious Whovians first gathered together. The future for the club has a distinct, rosy glow. The Guardians of Gallifrey has made its mark, and it will make more of an impression in the years to come. The Guardians of Gallifrey is here to stay! On February 21 & 22, 1987, the BBC Doctor Who Bus Tour came to the Mercado Centre, Orlando. The Guardians of Gallifrey was scheduled to staff the event, and members were eagerly awaiting the weekend and the opportunity to see Jon Pertwee. Preparations were proceeding smoothly. All was well. But let us now take a look behind the scenes at one of those little-known events. How do you make a celebrity guest feel welcome? This was a question well put, which was answered by the inspiration of having a card and fruit and flowers delivered to Mr. Pertwee’s hotel room before he arrived. Later in the afternoon, Dan telephones to check that our group is ready for the weekend. As I have him on the phone, I inquire about Mr. Pertwee’s hotel, explaining that the club would like to send him a welcoming gift and that Brian Sloman or one of his assistants was to have let us know where he was staying, but as yet we have heard nothing. Mr. Higgins promises to find out and phone back. There followed a mad scramble. The adrenalin level jumped into high hear. Katherine rushed out to buy the goodies while I guarded the phone. My vigilance proved fruitless (no pun intended). Mr. Higgins never phoned. Initiative then came into play. (We were too pumped up now to be thwarted.) At the briefing earlier in the week, the Mercado representatives had been very keen to book Mr. Pertwee in at the Radisson hotel just across the street from the Mercado Centre. Katherine therefore phoned the hotel to see if they had a reservation for Mr. and Mrs. Jon Pertwee. The desk clerk was more than willing to part with the information. Yes they had, but no they had not yet arrived. Action stations! It was now a race against time for Mr. and Mrs. Pertwee could arrive at any moment. The card was written, the flowers arranged (and a drinking glass sacrificed for a vase) and the fruit placed in a basket with a couple of bright blue bows. Then it was off to International Drive at Warp 10. Mr. Pertwee and his wife had still not arrived by the time we reached the hotel (and by this time the adrenalin level was on overload.) The gifts were handed over to the desk clerk who assured us that a bell boy would take them straight up to his room. We sighed a sigh of relief. Mission accomplished! As an epilogue to the incident, Mr. Pertwee loved his gift, publicly thanking the Guardians of Gallifrey in his talk on the afternoon of Saturday 21st. Guardians Charles M and Debbie B with Jon Pertwee at the Bus Tour. I WAS A DOCTOR’S COMPANION! Well, sort of: peer into the time scanner with me as we look back to the famous Bus tour of 1987, (my first Club function, by the way). Dressed in blue culottes, vest and silk tie I arrived bright-eyed and bushy-tailed bearing two dozen chocolate chip cookies for the refreshment of the members which, as I recall, lasted all of twenty minutes. I spent the first day standing watch in the TARDIS and sitting behind a table in the dealer’s tent. My English accent, picked up from Julie Andrews in Mary Poppins, was going full blast and convincing enough to move one lady to ask how long the Bus Tour and I had been in the U.S. But my great moment came on the second day when TaDa! I was appointed assistant to Mr. Pertwee during his autograph session. It was grueling duty, sitting next to the Third Doctor and passing him photographs to sign, but I suffered it gladly. My memories of that wonderful time are somewhat blurred after so many years, (actually I was pretty blurry at the time…) but I distinctly recall trotting hither and thither at the Doctor’s heels, just like Jo or Sarah Jane. On one of these journeys I asked a question that had been haunting me for some time: what was that glittering ornament hanging around his neck in some episodes? Mr. Pertwee had an endearing habit of putting an arm around one as he talked, perhaps to prevent one’s slipping away before he was finished (as if one would!). He did so with me as he explained that the glittery thing was in fact a quizzing glass that had once belonged to Charles Dickens, and had been a present from Katy Manning. That little tete-a-tete was the high point of my Bus Tour experience, but there were other moments. I arrived on the first day determined to pet K-9 and ride in Bessie. I achieved both objectives while packing up: patting K-9 when he was taken from his glass display case to be placed in his travelling crate, and piling into Bessie with several other Club members as we drove perhaps ten yards form her parking spot to the ramp into the truck. On the first day there was rain and Mr. Pertwee had good-humoredly complained that if he wanted overcast he’d have stayed in Blighty. The next day was sunny; what the Doctor wants the Doctor gets!